Selections from Urban Tumbleweed: Notes from a Tanka Diary by Harryette Mullen is the Songs of Eretz Poem of the Day and the offering from Poets.org's Poem-A-Day for May 12, 2014. A link to the poem may be found here: http://poets.org/poetsorg/poem/tanka-diary?utm_medium=email&utm_campaign=Poem-a-Day++May+12+2014&utm_content=Poem-a-Day++May+12+2014+CID_2ffcb99deeb6e013d323e81995cb0bf6&utm_source=Email%20marketing%20software&utm_term=From%20Tanka%20Diary. Urban Tumbleweed: Notes from a Tanka Diary was published by Graywolf Press in 2013. Harryette Mullen (b. 1953) teaches African-American literature and creative writing at the University of California, Los Angeles. Among her many awards and honors are an Academy of American Poets Fellowship, and the Gertrude Stein Award in Innovative American Poetry. Reference to this and additional biographical information may be found here: http://poets.org/poetsorg/poet/harryette-mullen?utm_medium=email&utm_campaign=Poem-a-Day++May+12+2014&utm_content=Poem-a-Day++May+12+2014+CID_2ffcb99deeb6e013d323e81995cb0bf6&utm_source=Email%20marketing%20software&utm_term=Harryette%20Mullen. Each selection is presented as a tercet, rather than a cinquain as would be expected in a tanka; however, the thirty-one syllable requirement for tanka is followed. The first one, my favorite of the four, offers a profound insight into the workings of time--a fourth dimensional moment. 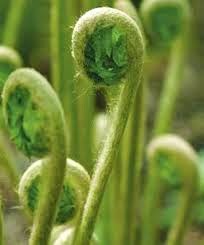 The second and third selections are cleverly linked by reference to a "scroll" in the third which mirrors the scroll-shaped "fiddleheads" in the second. All four selections are linked in that they speak of a journey through progressively more difficult terrain in an effort to find meaning and wisdom in nature. The journey begins in the most controlled environment--a man-made botanical garden--and progresses through a fern-covered forrest, birch-covered foothills, and finally into the mountains in a quest to find a place where the heart of Nature and the human heart merge.